I was amused this morning, on my way to work. I was driving, just outside the library, and saw a student who was probably third or fourth year. He was in an outfit suitable for an ivy league junior professor, tweed jacket with elbow patches, slacks, tie, the whole bit. The amusing part is that he was on a skateboard, going uphill. That's quite a bit of work- you have to push quite a bit. OK, maybe I'm easily amused. I was at the Reference Desk, helping one of the emeritus faculty with his research. He retired in the 80s, and bless his heart, still wants to give lectures to the community. He comes to me to get recent articles- but the authors writing in the 80s aren't always writing now. Today he wanted help with a citation manager, which I finally took to mean that he wanted the citations coming forward in time. And WHEEE! I finally figured out that Google Scholar does what he wants! I did a bit of a victory dance, hands in air, chair dance sort of thing. What can I say, I love my job, and I get enthusiastic. And that seems to amuse the students near by-- I heard snickering, looked up, and yup. The students were definitely amused. Which sent me into a fit of giggles, which pretty much escalated the amusement all around. Ah, well. Life is good. I seem to be in an upward mood swing. Thank God and Prozac, I still have the ups without the downs. How cool is this? 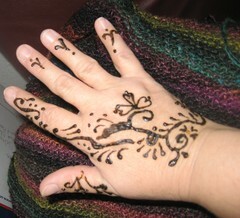 I got henna'd today! Today was the Campus Faire (previously the Craft Faire when I was running it...) I sat there and blissed out with the spinning wheel. It was warm, about 70F, I was in the shade, life is good. I sold one skein, wasn't even expecting to. I got a couple of skeins plied, and spun another bobbin for a Salish sweater. Sunday, we went shopping for a car. Holy cr*p, it looks like we're going to get a Cadillac SRX. We test drove a Saturn whatever their mid-size SUV is, and their seats are comfortable, but hard to get adjusted correctly. It pretty much tweaked my sciatica... not so good. But the Caddy was like buttah. wow. Whooda thunk. It's gonna take a while before it doesn't feel pretentious, though. The clincher? I forgot I was supposed to be on the Reference Desk. D*mn. You know what the strongest evidence that I'm not up to par? I really wasn't prepared for today's Craft Faire at all. I could have had a lot more spun, but I just couldn't get enthusiastic about it.